Blend liquid ingredients and chocolate until super smooth. You can adjust the amount of sweetener and chocolate to suit your tastes. Transfer mixture to separate bowl and stir in chopped almonds. Feel free to add other goodies�?�coconut, berries, etc. I added dried blueberries to one batch I made, with wonderful results. Spread on a plastic wrap lined plate or dish and place in freezer to cool, then chow down. 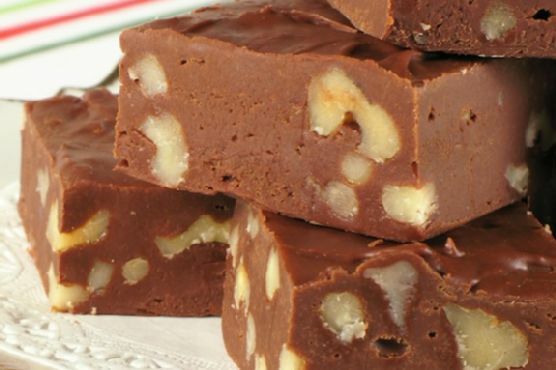 Cream Sherry, Moscato d'Asti, and Port are my top picks for Fudge. A common wine pairing rule is to make sure your wine is sweeter than your food. Delicate desserts go well with Moscato d'Asti, nutty desserts with cream sherry, and caramel or chocolate desserts pair well with port.